I made a really gorgeous no-knead bread this week. Even with my crummy point-and-shoot camera, you can see the tiny bubbles along the surface of the crust. This bread not only sprung up like you see, but the entire crust was shattery when it came out of the oven. This one took two days. It’s been so cold, and I’m such a miser, that my house has been hovering between 57 and 62 all week. I mixed up the regular old no-knead recipe in the middle of the day Monday. Three cups flour (I use half bread flour, half all-purpose, King Arthur only), 1/4 teaspoon yeast, 1 tablespoon salt, and enough water to make a wet shaggy dough. The next morning, it hadn’t really risen much, so I moved the bowl to the living room, in the vicinity of the heater. By evening it had risen, but I didn’t have the energy to deal with it after another crazy day at my real job, so I left it until morning. The next morning I dumped it out, kneaded it a little bit, just because it seemed sort of stiff. Once it felt all warm and elastic, I shaped it into a nice tight boule, dusted it with some flour, and put it aside to rise. Again, nothing happened. Too cold in my house, and the surface of the dough started to dry out and toughen up. Back to the corner of the living room side table where it was a little warmer, and I tucked a clean damp cloth napkin around it so the skin would soften up a little. By mid-afternoon it had risen to the point where if you poked it, a dimple remained, usually my marker that it’s time to bake. So I heated the oven to 425, put my big Le Crueset in to heat up, slashed an x in the top of the bread. When the oven and the pot were hot, I put the dough in, and sprinkled a little water in to make steam. It was a gorgeous loaf. 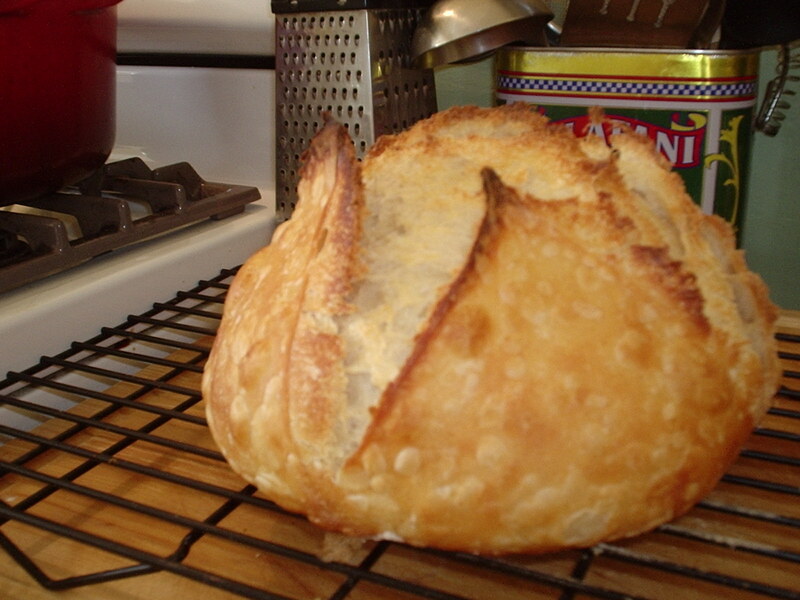 It really sprang up, the crust was wonderful, and the crumb was very elastic and stretchy. I think it was the long slow cold fermentation that made this one so good. I’ve been making this bread for what, three years now, and one thing I love is that it changes a little bit every time. Sometimes it’s ordinary, and sometimes, it’s just beautiful. Like this one. I’ve never slashed the top. I’ll have to try it. That looks beautiful. It looks a little like a sourdough loaf I sometimes buy, did it have that kind of flavor at all?